Opps, this picture above does not represent any of the USS Des Moines cruises. CRUISE BOOKS - If you have a book that we don't have, please send to the web master, see address on HOME page. The book will be returned undamaged. My name is Clair Buckingham and I was on the ship from the shakedown until 1952. 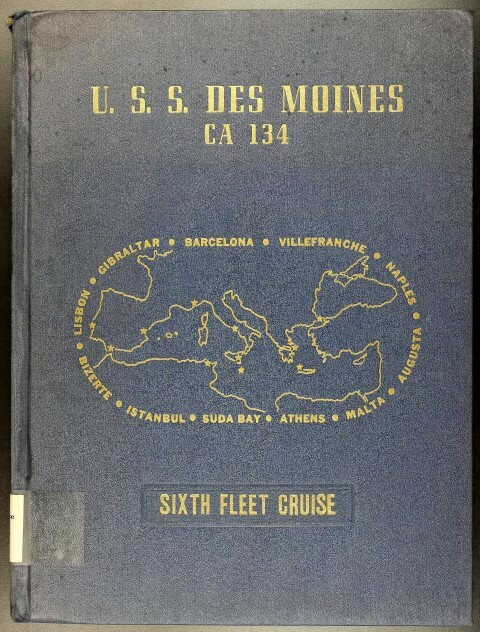 I have the 1951-1952 cruise book which is the first one you list and I don't remember any ones for the first two cruises in 1949 and 1950. It was only the latter cruises when someone decided that a book would be nice. Thanks to Bruce Webster, son of Lt. David Andre Webster (Retired Rear Admiral), for sharing his Father's Cruise Book.